I'm not someone who uses fake tan year round but I do like to give my pale skin a little boost as we head into summer and I recently tried He-Shi Face & Body Tanning Gel. 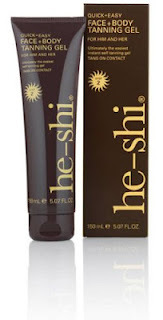 He-Shi Face & Body Tanning Gel is a relatively new launch from the specialist tanning brand (click here to read my interview with the brand's co-founder, Shelley McMurray) and I have to say that overall, I'm impressed. The brown and yellow packaging feels suitably summery and, in keeping with the brand name, would appeal to both men and women. I liked that the gel is presented in a functional tube and that the directions for use are very clear. Whenever I use fake tan, I like to use a tanning mitt as I find that it makes application a breeze and I don't have to worry about telltale stained palms and this time was no exception. I applied He-Shi Face & Body Tanning Gel using the Tanning Mitt from the same range and only used the product on my body, preferring to bronze my face with makeup. As the name suggests, He-Shi Face & Body Tanning Gel is a thick gel formula which makes for a mess free application. The gel itself has a "guide colour"- a dark tint designed to make application easier so that you can clearly see where you have already applied the product. This also means that you appear tanned instantly, even though it takes a few hours for the colour to truly develop. When I first squeezed the product out of the tube, I was initially shocked at how dark the colour was but I shouldn't have panicked as it doesn't apply to the same shade depth. As with any fake tan, you can apply more layers of product for a deeper colour. The packaging states that you can dress after two minutes and whilst it's true that the gel formula does dry relatively quickly, it definitely took longer than just two minutes. At first, I didn't notice any strong scent but it certainly became more prominent as the hours progressed and the tan developed. Personally, I don't find the "biscuity" scent associated with fake tan particularly offensive so this didn't bother me too much. The colour that developed was very natural indeed, with no orange at all due to the inclusion of subtle green tones in the formula to counteract this. What's more, I was impressed at how long the colour lasted. Obviously, this will vary depending on your skin type and lifestyle but I still had a natural hint of colour up to a week later. The only complaint I had was that I found my skin became incredibly dry after using this, although I have been testing a few different products recently so I can't say for sure that the dryness was down to the fake tan. Overall, I'm impressed and will definitely use this again. In particular, I feel that this would be a good choice for fake tan beginners as it's such an easy product to use. I feel that £17.50 for the 150ml tube is a fair price. Great review, got to try it myself. It's not great for your skin to sunbathe to much, so this is a great alternative. Hi, Thanks for sharing nice post.I had been searching for many times about this.But this post stopped my searching.Thanks again.